BTW, did you ever get that Blue Peter Badge? I had a strange fascination with these and had a particular fondness for the Badger; from which I could be found regularly removing the cork from its bum to remove some of the newspaper that had been inserted in there. I was apprehended in the act a number of times before finally being made to stand in front of class and explain why I persisted in this behaviour, at this point I was indeed lost for words (A rare occasion) and shamed into never assaulting the said creatures plugged behind again. Now I learnt from this experience and applied it in later life; so that whilst I would never open a presentation or stand before people and recount this tale as my gambit, I learnt to be prepared to answer any questions if you ever indulge outside the norms of behaviour! I wish I knew you when you were a lad…you always manage to make me smile. I have checked but cannot find a condition to describe Badger love or indeed Badger phobia, apparently Clive Owen has a fear of them! I now know how to disarm him in a fight – just thrust one of the furry little mint humbugs at him and he will run! I had a run in with one once – pretty fierce. Perhaps it had heard of my cork/newspaper antics in the past! I don’t know that I have a similar story, though recently at a Taj Mahal concert I was tempted to pass him a love note of sorts. If he’d called me out on it, it would have been embarrassing! Unless he was offering to take me up on it? Ok. This is bad. I had a crush on the boy with the locker next to mine when I was 11. I wrote a love letter to myself as if he were writing it. Of course, I didn’t want to carry it around all day to chance anyone seeing it, so as I passed my locker, I slipped it through the vent. Turns out that, in my haste, I missed my locker by one and slipped it into his locker. I’m amazed to this day that I ever survived the embarrassment, and I’m even more amazed that I’m confessing it now. Lol. Ever since, I’ve been very careful what I write done. Except for in this comment, that is. Very fun blog, Donna. And John Travolta was quite cute back then. No one could blame you. Were you madder at the boy or the sister? – hopefully he is single, balding, and a social outcast with a beer belly that costs him his entire income to keep stabilised. And whilst he sits before an electric fire – one bar on, clutching tightly a can of cheap lager, he can only but imagine the lost love that shunning the delighfull Donna all those years ago, he deprived himself of. LMAO – You never fail to make me laugh! He isn’t on FB and didn’t turn up to the reunion we had, so I reckon you’re on to something! OK, since you put yourself out there want to know what my first concert was? Ready….Andy Gibb. No Joke. I was maybe 11. Me and my friends held up a sign that said “Take off your shirt” and he did. We thought that was great…. I quickly got over that and became a Dead Head, but that lead to other not so shinning moments we’ll leave to your imagination! Ha ha ha, andy Gibb – and you got him to strip! That is a classic. Do you have any pictures of it? But I still think Travolta is hot. Its a good job he see it first and not Robin! My freshman year in college I (still) had a HUGE crush on actor Chris Makepeace. I printed a poster that read “CHRISTOPHER MAKEPEACE IS TOTALLY AWESOME!! !” and hung it on my dorm room wall. MY roommate rolled her eyes but said nothing. I left it up for an entire semester. Okay, Kristen Lamb, posted this blog post to facebook and I followed the link here. I’m LOVING this thread. When I was 8, I wrote a letter to Andy Gibb which contained a song I wrote asking him his thoughts. I was really inspired by his song, (Love Is) Thicker Than Water. HA! awesome. Cindy, did Andy every reply? Too funny! I wrote a fan letter to Sting when I was 8. I was a big fan of the Police and I knew he was the real talent of the group. Knew that one was gonnna go far. Burt Reynolds was my first crush, and then Bo Duke from The Dukes of Hazzard was the second. Oh and then there was Larry Hagman as Major Nelson. Then Buck Rogers. Sting was one of the first 50 crushes. Of that I am fairly sure. 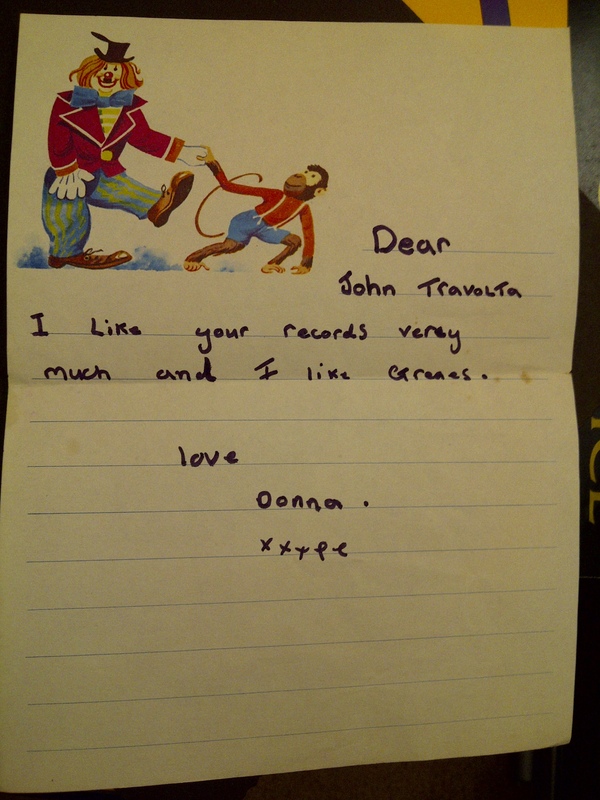 He was the only one to get a real fan letter, so that does make him special. Oh, the song I wrote was about a dove. LOL. Too funny! You need to post the song here, :D. We will help you set it to music, LOL. Just swipe something from Queen. Thats what all the rappers do. I was heartbroken when Arnold Schwartzenegger married. Was there anyone I DIDN’T have a crush on? Maybe that would be an easier list :P.
An embarrassing situation pops into my head as I read the other posts. 8th grade, crush on the most popular boy in the school. Me…poor side of the tracks. I wanted to go to the school dance SO bad. Nothing to wear. Short version. Older sister, outgrown dress. She suggested I wear it to the dance. Picture – candystriped, puffy sleeves, totally didn’t fit me right. Oh, he asked me to dance, all right. I answered yes, and he said. “Come on, I’ll help you look for someone.” He burst out laughing and I fled to the ladies room. I burned the dress. Life has been kinder to me since high school!! OMG, That is terrible. I feel really awful smiling at the moment! Amazing how we both spent most of our school dances in the toilets, hiding in shame, lol. I think you should just be proud that you had good taste at such a young age. You knew, early on, that Grease would be huge, and that we would be loving it for decades. Nothing to be ashamed of there 😉 My elementary and middle school have now ended up being such losers than I can only thank God I never got a chance to be with. I was 12 when Grease came out and I can tell you it was the biggest moment of my life. All my friends bought the soundtrack and we would reenact Grease day and night. I was more of a Knickie girl myself though. LOL, oh God, just when I thought I could not embarass myself anymore, you go a post this comment and it reminds me of something else. My sister and I used to pull out our sofa and while ‘You’re The One That I Want’ played, we would bob up and down behind it, mimicking Travolta and Newton-John. I think I’m with Kristen, there weren’t many men I didn’t have a crush on. For me it was Harrison Ford, and embarrassingly enough Gilbert Blythe from Anne of Green Gables and also Richard Chamberlain in The Thorn Birds. Why did my mom let me watch that so young??? It’s disturbing really. My embarrassing moment…I decided during a game of four square it’d be a good idea to jump on my crush’s back for a piggy back ride. He then proceeded to martial arts me over his head and I came crashing onto the blacktop. Do you remember your first crush? I was three. My neighbor, Austin, tried to attack me with a stick while I was swinging. It was love at first sight. lol. LMAO – Now that is the sort of thing that would happen to me! Classic! My first crush, that I can remember, was a boy who lived in the next road. We used to sit behind the dustins (clearly I was easy to please back then) and plan our future…. Great blog! And it sure does bring back memories! I, too, was in love with Andy Gibb (what a waste of a beautiful, talented man). I also fell in love with Ringo Starr when I saw the cover for their album, Let It Be. What a cutie! But my embarrassing moment happened when I was about 18. The manager at one of the grocery stores was probably in his mid- to late twenties and a very nice man. Always nice to me anyway. Probably everyone else, but I took it to heart, looked him up in the phone book, called him up and asked if he would like to go out for supper with me. Reminds me of the time my sister and I chased a John Travolta look-a-like around a camp site until he danced with us. I was only eight at the time.